Former Los Angeles City Councilmember Bill Rosendahl, the first openly gay man elected to the council and one of the city’s most exuberant boosters, died Wednesday following a four-year battle with cancer. Rosendahl died around dawn at age 70, said Councilmember Mike Bonin, who succeeded Rosendahl on the council. Phyllis Hayashibara of the VJAMM committee and former Los Angeles City Councilmember Bill Rosendahl with a full-scale model of the monument on April 23, 2015. 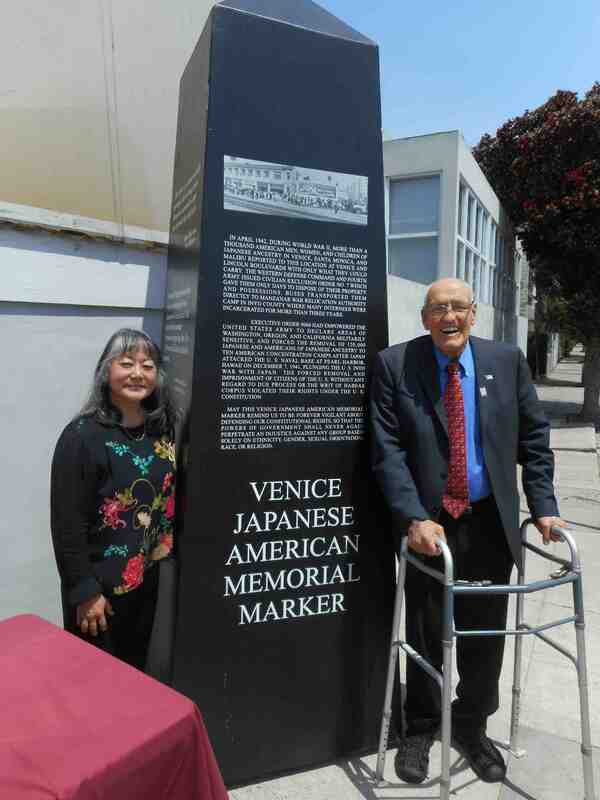 Rosendahl was also an early supporter of the Venice Japanese American Memorial Marker, donating $5,000 in 2011. “As Los Angeles city councilmember for the 11th District, Bill championed the cause of the VJAMM, inviting New Media Academy students from Venice High School to make their presentation for a permanent memorial in front of the entire Los Angeles City Council at City Hall in Downtown L.A. in May 2009. Bill continued his active support for the VJAMM by appearing at community meetings, at VJAMM fundraisers at Hama Sushi, and by bequeathing his enthusiasm and passion for the VJAMM to his successor, L.A. Councilmember Mike Bonin. Rosendahl was also a supporter of the Venice Japanese Community Center during his time in office. Mayor Eric Garcetti said Rosendahl — often called the “conscience of the City Council” — was an outspoken advocate of the underdog, despite the fact that he represented portions of the city’s west side that contain some of the city’s most affluent neighborhoods. In July 2012, after collapsing suddenly, Rosendahl was diagnosed with Stage 4 cancer of the ureter, a tube that connects the kidney to the bladder. He was told he did not have long to live. A Catholic Mass is set for 10 a.m. on Tuesday, April 5, at St. Monica’s Church, 725 California Ave., according to Bonin. Another event honoring Rosendahl, “GREAT GREAT GREAT: A Celebration of Life,” will begin at 2 p.m. on Saturday, April 16, at Mar Vista Park, Bonin said. The public is welcome to RSVP for the services at www.11thdistrict.com/remembering_bill.